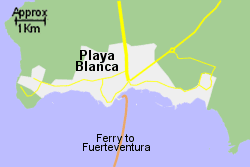 Map of the Playa Blanca Ferry Port area. 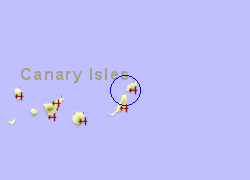 The holiday resort of Playa Blanca on the southern edge of Lanzarote has a small ferry port which is convenient for trips to Fuerteventura, the distance between the two Canary Islands being approximately 12km at this point. 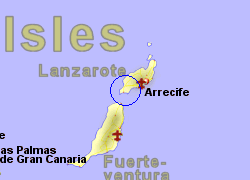 Connected to the islands capital, Arrecife, by the LZ-2 trunk road, the journey by car takes around 40 minutes. 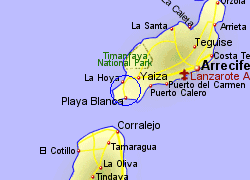 A bus service runs every hour during the day (less frequently at week ends) between Playa Blanca and Arrecife via Puerto del Carmen, with a journey of around an hour. Operated by Armas with up to 6 crossings per day, crossing time 35 mins. Also operated by Fred Olsen with up to 7 crossings per day, crossing time 25 mins.